This John Hancock letter was written during the spring of 1777 after Congress returned to Philadelphia from Baltimore where they had fled when the British occupied Philadelphia. As President of Congress from 1775 to 1778, Hancock oversaw some of the Congress' greatest achievements, including the Declaration of Independence and the adoption of the Articles of Confederation. John Hancock also saw dark times. 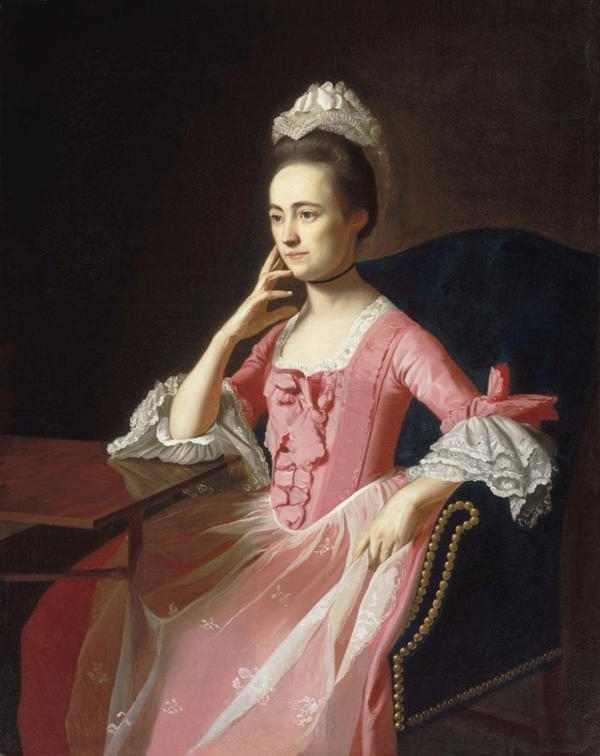 During Congress' exile from Philadelphia to Baltimore, his daughter Lydia was born to his wife Dorothy. After the British left Philadelphia, Congress returned, but Dorothy and Lydia remained in Baltimore for some time. John was frustrated with the absence of many congressmen and lonely due to the absence of his family. This letter shows some of the frustration this important man was facing during the crisis that made America. my Dear Dear Dolly: My detention at the Ferry & the badness of the Roads prevented my arriving here untill Friday Evening. I put my things into Mr. Williams' house, and went in pursuit of Lodgings. Neither Mrs. Yard nor Lucy could accommodate me. I then went to Smith's and borrowed two Blankets & returned to my own house; soon after which Mrs. Smith sent me up a very handsome supper, with a Table cloth, Knives & forks, plates, salt, a print of Butter, Tea, double refined Sugar, a Bowl of Cream, a Loaf of Bread &c &c here I have remain'd and shall do so waiting your arrival. Indeed Mrs. Smith oblig'd me much. I however lead a doleful lonesome life. Tho on Saturday I dined at Dr. Shippins. He desires his Regds. he is as lonesome as I. On Saturday I sat down to dinner at the little table with Folger on a piece of Roast Beef with Potatoes. We drank your health with all our Baltimore friends. Last night Miss Lucy came to see me, & this morning while I was at Breakfast on Tea with a pewter tea-spoon, Mrs. Hard came in. She could not stay to Breakfast with me. I spend my evenings at home, snuff my candles with a pair of scissors, which Lucy seeing, sent me a pair of snuffers & dipping gravy out of the Dish with my pewter tea spoon, she sent me a large silver spoon and two silver tea spoons — that I am now quite rich. I shall make out as well as I can, but I assure you, my Dear Soul I long to have you here & I know you will be as expeditious as you can. When I part from you again it must be a very extraordinary occasion. I have sent everywhere to get a gold or silver rattle for the child with a coral to send but cannot get one. I will have one if possible on yr coming. I have sent a sash for her & two little papers of pins for you. If you do not want them you can give them away. However unsettled things may be I could not help sending for you as I cannot live in this way. We have an abundance of lies. The current report is that General Howe is bent on coming here, another report is that the Mercht's at New York are packing their goods & putting them on board ships & that the troops are going away, neither of which do I believe. We must, however, take our chances, this you may depend on, that you will be ever the object of my utmost care & attention. I have been exceedingly busy, since I have been here, tho' have not yet made a Congress, are waiting for the South Carolina gentleman. If Capt. Hammond is arrived with any things from Boston, You will have them put in the Waggons and brought here. If she should not be arriv'd leave the Receipt with Mr. S. Purviance & desire him to receive the things and send them to me. The inclosed Letter give to Mr. Newhouse, one of the Waggoners, Send for him & let him know when you will be ready. I hope you will be able to pack up all your things quickly & have them on the way & that you will soon follow, be careful in packing and do not leave anything behind. Let Harry see that everything is safely stored in the waggons. I send Mr. McCloskey, he will be very useful. I am confident Mr. & Mrs. Hilligas will assist you, pray my best Regds. to them. I have not had time to go to their house but intend it today & shall write Mr. Hilligas by the Post. Young Mr. Hillagas got here on Saturday, he is well, he delivered me your letter & one from his father. I was exceeding glad to hear from you and hope soon to receive another Letter. I know you will set off as soon as You can. endeavor to make good stages. You may easily lodge at Mr. Steles' at Bush the first night. It is a good house. However I must leave those matters to you as the Road must in great measure determine your Stages. I do not imagine there is any danger of small-pox on the Road. Wilmington is the most dangerous, but go on to Chester. I want to get somebody cleaver to accompany you. I hope to send one to you, but if I should not be able, you must make out as well as you can. I will write by the Post tomorrow. I can't add as I am now call'd on. I hope no accident will happen. Inclosed you have a few memo, as to pack'g &c which I submit to your perusal. Doctor Bond call'd on me, Desir'd his complements. He will inoculate the child as soon as it comes. Mrs. Washington got here on Saturday. I went to see her. She told me she Drank tea with you. Let Harry take the Continental Horse, Saddle & Bridle, that I left at Mr. Purviance's & tell Mr. Purviance to charge his keeping in his public credit. If Capt Hardy returns the Horse I lent him with the Saddle & Bridle he must also come. Get the heavy waggon off as soon as you can, that they may be here as early as possible as we shall much want the things after you get here. I have got your bundle safe with the Petticoat, Table Cloth, I have not sent it as I thought you would not want it.